“These cowboys like the horses fast, and know exactly how to spur a woman toward her greatest pleasure…” Includes the following stories: Saddled—After rescuing a beautiful woman when her car slides into an icy creek during a snow storm, Bobby Blackhawk and Cale Yancey do the only thing two lonesome cowboys can—they take her to their isolated cabin and get naked. Unbridled—Justin Cruz has waited a long time for this moment. He knows his bad-boy reputation, but since he seduced Rowe Ayers, he’s been a one-man cowboy—waiting for pretty Dani Standifer to return and become the delicious fulfillment of his and Rowe’s needs. If she’s up to the challenge. 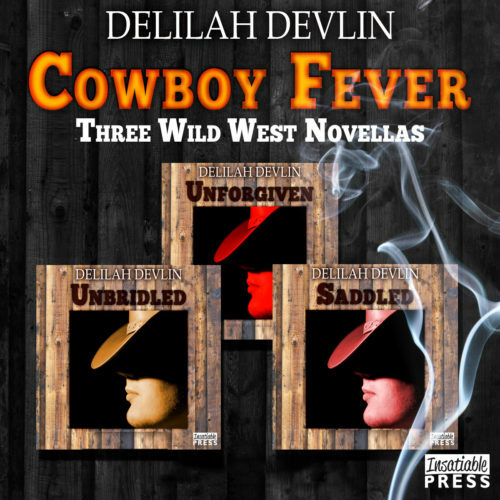 Unforgiven—For Cutter Standifer, the pretty little redhead who opened a café in Two Mule, Texas was “the one.” Until he caught her in a compromising position with the town’s worst womanizer. A year later, he still can’t forgive Katie Grissom. And forget? Forget, hell. He’s ready to kick his code into the nearest manure pile and take what he never had from her—full satisfaction.